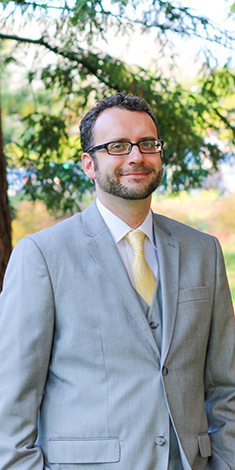 Jason Mockford is the Director of Leadership & Service in the Dean of Students office at California Polytechnic State University in San Luis Obispo, California. He is originally from Auburn, California and holds a B.S. in Graphic Communication and an M.A. in Counseling & Guidance, Higher Education, both from California Polytechnic State University. Jason has been involved in a leadership role with NODA, the Association for Orientation, Transition and Retention in Higher Education as a Transfer Services Network Chair from 2011-2014 and as a member of the Annual Conference Advisory Committee in 2014. For six years he has been responsible for advising Cal Poly’s orientation board, Open House committee, and developing the nationally recognized orientation leader training program. He has served in leadership roles both on the Cal Poly campus and in national organizations. On top of all of these roles he is also a mediator with Creative Mediation in San Luis Obispo and serves on their Program Advisory Board. He believes leadership is about leveraging social influence to motivate others to action towards a shared vision or common purpose. When asked what he is passionate about he explained that he likes to play where science and art meet. Heather Domonoske is the Lead Coordinator of Center for Leadership. She is originally from Claremont, CA and studied Environmental-Sociology and Economics at Whitman College before completing her M.A. in College Student Personnel at Bowling Green State University. Heather's passion for leadership began during her undergraduate experiences as a Resident Assistant, a Head Lifeguard, leading trips for Whitman's Outdoor Program, and serving as Whitman's Outdoor Program Trips Coordinator for two years. She has been working for Outward Bound (in North Carolina, Florida, and Washington) as an instructor on backpacking, sea kayaking, canoeing, rock climbing, and whitewater canoeing courses since 2013. 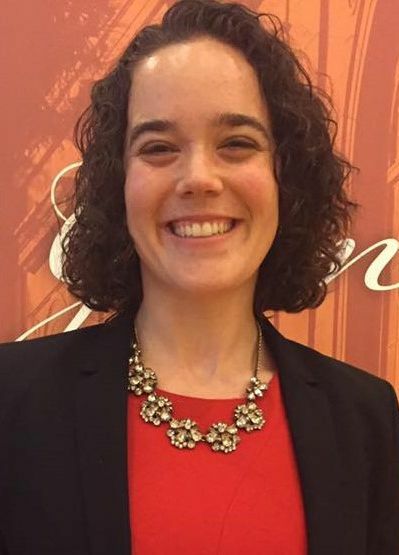 During graduate school, she worked in leadership education, facilitated social justice programs, mediated student conduct and conflict resolution, interned for marketing and recruitment for her master's program, and taught leadership seminars at Bowling Green State University and the University of Michigan. Heather most recently worked at the Evergreen State College as a Resident Director where she worked with the first year living communities, the outdoor interest and legacy hall (an intentional multicultural community) themed communities, served on the orientation planning committee, and supervised resident assistants. She strives to support the development of socially responsible leadership at Cal Poly and is very excited to be a part of the Centers team. Heather is passionate about education and creating environments for growth, self-discovery, and community that provide meaningful experiences for all students. She believes leaderships is non-positional and is strongest when done in relation with others; therefore, creating intentional and meaningful relationships built through an expansive equity lens is critical. In addition to her passion for leadership, Heather enjoys getting outside, cooking, spending time (in person or on the phone) connecting with friends and family, and playing with her cat. Elizabeth Thomas is a Coordinator in the Center for Leadership. She is originally from Austin, TX where she developed a love for tex-mex, karaoke, and water sports. She received her Bachelor of Fine Arts in Theatre from DePaul University in 2013. During her undergraduate career, she served as an Orientation Leader and Welcome Week Coordinator. These experiences sparked her interests in mentorship, leadership, and student affairs in general. After graduation, Elizabeth worked in the Chicago real estate business for two years before obtaining her Masters in Higher Education from Loyola University Chicago. 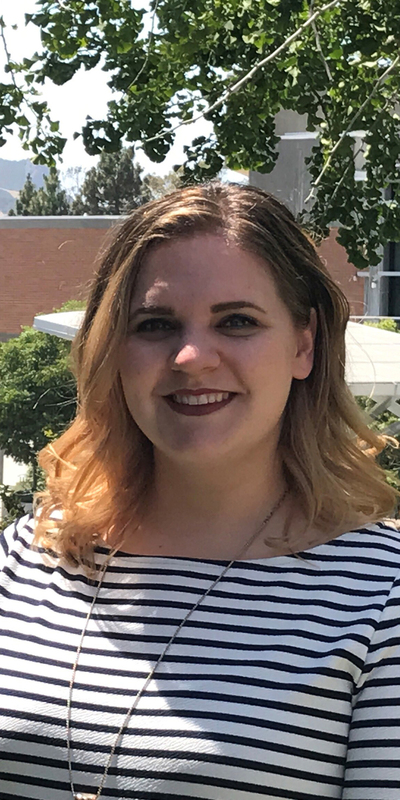 During her time in graduate school, she gained experience in campus activities and residence life, and was introduced to Cal Poly’s campus as a NODA intern for New Student & Transition Programs during the summer of 2016. Elizabeth’s passion for leadership became more prevalent while teaching a course on leadership and service for first year students during the second year of her master’s program. In her work, Elizabeth strives to integrate social justice and leadership and show how these subjects contribute to the holistic development of students. She believes that leaders are made, not born, and that the most important facet of leadership is cultivating a passion for learning from and with others. In her spare time, she loves to explore the outdoors, hike, kayak, and delve into her creative side through singing and playing guitar. She also values time with family and enjoys spoiling her niece and nephew every chance she gets. Isheeta Rahman is a Graduate Assistant for the Center for Leadership. She is originally from San Diego, California and earned her B.A. in Political Science from UC Irvine in 2015. 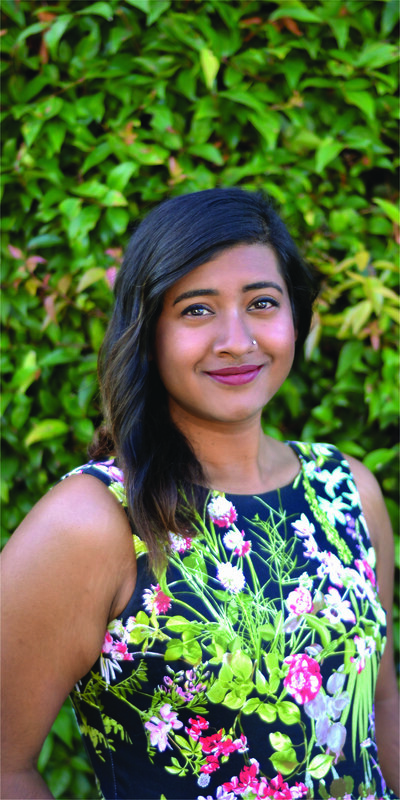 She wrote her undergraduate thesis on a historical comparison of California’s Congresswomen, and presented her findings at the 2015 UROP Conference at UC Irvine. She is currently enrolled in Cal Poly’s Counseling & Guidance in Higher Education/Student Affairs graduate program. As an undergraduate student, Isheeta worked for Residential Life for three years, as a Community Programmer, Community Assistant, summer Resident Assistant, and a supervisor to a team of summer Resident Assistants. She attended the 2012 PACURH and 2013 NACURH conferences as a Residential Life delegate for UC Irvine. She also worked for three years as a Campus Representative, giving campus tours to visitors. These positions transformed her undergraduate experience, and sparked a love for the holistic development of students in higher education. Isheeta believes that leadership exists in everyone in beautifully diverse ways, and that we learn to be leaders by living our values with integrity, appreciating ourselves and others, and engaging in personal and community-wide development. In her free time, Isheeta has a wide array of personal hobbies and interests. She loves to sing and enjoys playing many musical instruments, such as violin, piano, guitar, and ukulele. She loves to exercise, both in and out of the gym. And she loves adventures of all kinds. "Failure is another stepping stone to greatness"
Emily Isabel Garcia is one of our graduate assistants in the Center for Leadership. She was born and raised in Santa Maria, California where she attended Allan Hancock College before transfering to Cal Poly SLO in 2016. She received her bachelor’s degree in Communication Studies in the Spring of 2018 and is currently enrolled in the Higher Education Counseling/Student Affairs graduate program at Cal Poly. While Emily was attending Allan Hancock she was a part of the TRIO program and worked as a student assistant in the Office of the Vice President for Student Services. When she transferred to Cal Poly she became a student worker in the IT Department and was an intern for the College of Liberal Arts Advising Center where she mentored students on academic probation. Throughout her college journey, Emily was able to experience opportunities that led her to become passionate for student development and success. Emily believes that leadership exists in every person and that it does not exclude anyone. She is excited to be working in the center and see each student thrive as they discover the leader within themselves. When Emily isn’t in the center or in class, she enjoys spending time with loved ones and connecting with the community through her local church. A few other of her enjoyments are dancing (especially latin, jazz, and hip hop styles), hanging out at coffee shops, and finding new places to explore on the central coast.